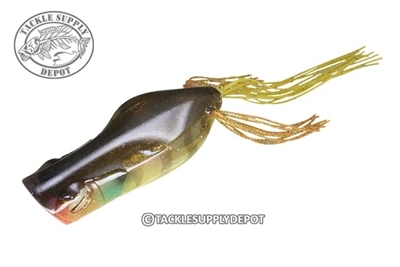 The Jackall Gavacho Frog has one thing in mind and that is to call hungry bass from the thickest slop. The unique cupper mouth offers a fine water spray with each snap of the rod tip whether being worked with a strong pop or erratically walked. The body of the Jackall Gavacho Frog is contoured around the bend of the deadly sharp double frog hook providing an ideal streamlined profile which comes through snag prone terrain with grace. Walk It, Pop It, Spit It and repeat; the Jackall Gavacho Frog is ready for the task at hand.